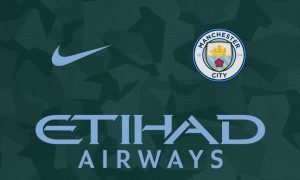 Manchester City have unveiled their new, camo-green third kit of the 2017/18 season. The latest Nike creation will be worn during this season’s Champions League campaign, possibly debuting away at Dutch side Feyenoord on Wednesday evening. Manchester City launched their reveal with a club shoot featuring first-teamers Danilo, John Stones and Kyle Walker at the CFA Academy Stadium. Under the floodlights the deep camo-green gives off a distinct darker colour and has ‘CITY’ stitched into calf of the socks and the lower back of the shirt. Get your Manchester City 2017/18 third kit online now! Pictured: New images of 2017-18 Manchester City third kit shirt! Revealed: First images of the 2017-18 Manchester City third shirt!